Celestron AVX Mount and Controlling Software! I am new at Astrophotography and just purchased a Celestron AVX Mount. At this time, I plan to use one & possibly two EOS Digital cameras and lenses from a 11–16mm Zoom on up to a 150-600mm Zoom in lieu of a scope. I have downloaded and installed several different Mount-controlling software pkgs., including Backyard EOS, Astro Photography APT, and Starry Night Celestron SE 7. Having the temps bounce well below freezing (-20 to -30° F) and having 12 - 20 inches of snow on my deck, I set up the mount inside to make sure the basic functions worked and the camera & Vixen mounts work as planned. Do any of these Software Pkgs, (Backyard EOS, Astro Photography APT, and Starry Night Celestron SE 7) work with the AVX Mount? It seems unnecessary to have a computer and Hand Controller both telling the Mount what to do and where to go; do any of the programs allow you to bypass the Hand Controller by plugging directly to the AVX Mount? Or is the Hand Controller the Mount's computer? With all that, has anyone used Celestron Starry Night Pro Plus 8 with the AVX Mount? 1) To control an AVX you need one of two software capabilities ... either one with built in NexStar mount control OR one that supports an intermediary platform (software) such as ASCOM for Windows or INDI for Linux. With the platform approach you can then use any scope control app that works with that platform. 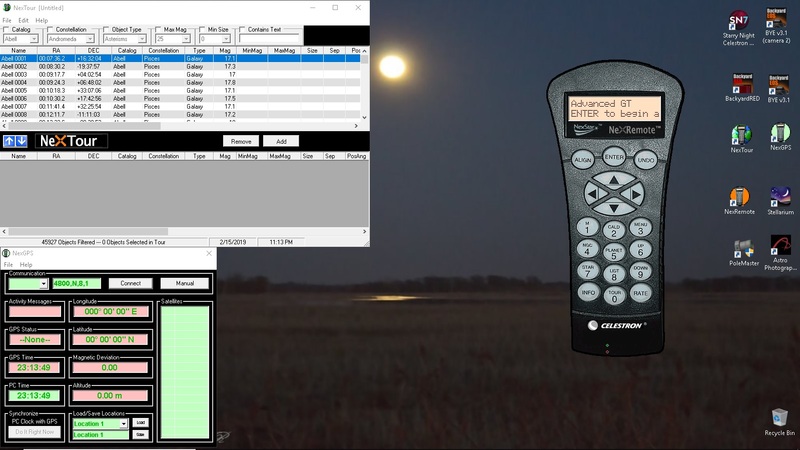 2) To be able to bypass the physical hand controller you can use only a few apps - From Celestron, the old NexRemote app, or the new CPWI app, both apps require Windows. The version of the new CPWI that works with the AVX is still in beta form so you'll need to become a teamcelestron.com member to get it. The other app from Celestron is SkyPortal, it's available for Android or IOS. There is one external app that is capable of bypassing the physical hand controller - SkySafari from Simulation Curriculum which is also a mobile app for Android or IOS. CPWI, SkyPortal, and SkySafari can use the wifi dongle (SkyQ Link or SkyFi adapters) and control the AVX wirelessly. All the other methods of control have to be tethered (either physically via a serial or USB cable or logically with some additional hardware that replaces the physical serial cable). SNP 7 supports a couple of methods of controlling an AVX. If you are using Windows then download the ASCOM platform and the Celestron unified mount driver from the ASCOM-standards website. Then use either (depending on which type of hand controller came with your mount) the Celestron hand controller serial cable and a USB-serial adapter (or a wifi replacement for the cable) OR if your hand controller has the mini USB port just a USB cable between your PC and hand controller. If you are using SNP on a Mac then you can select the Celestron mount plug in to support direct control of your AVX and use either of the two connectivity methods mentioned above (serial or USB) to your hand controller (or a wifi replacement for the serial connection). So simply you have two general options - with the physical hand controller and SNP software using a physical connection between them, OR SkySafari app on a tablet or phone and a wifi connection directly to the mount (no hand controller). Edited by mclewis1, 15 February 2019 - 03:06 PM. Mark is correct. You still need the hand paddle if you want to just plug in a USB cable as it goes into the bottom of the handpaddle, Get an active USB extender and it should work fine. You can't go straight into the AUX port except with the wifi adapter sold by Celestron and I have not experience with that. APT works, as does SGP. Getting aligned can be done with platesolving and you can just use the Celestron app which is a virtual handpaddle with pretty much all the features of the physical one. Getting all the com ports straight can be a challenge especially if you move the USB connections around. You will have the mount, an auto guider, the camera, etc all using USB. Some of these devices don't liike moving around for some reason. I actually ran a separate active extension cable for my SSAG as it was particularly finicky about being on the same USB bus with others and that helped. I did have the celestron mount drop off from time to time and from what others have indicated here it may be a USB to serial thing that drops things off. It can be frustrating when PHD2 reports that it is no longer connected to the mount 8 images into a 20 image run. I would have to intevene and reconnect, but no trip outside was needed. I wish Celestron would just have an RS232 port on the scope itself so I could go straignt serial from my PC that has a serial port card on it, but that is not the way they went. Of course, these are my experiences, so as others have said YMMV. 1. They all do. Depending on the software, they may need ASCOM to work. 2. You need to first align with the HC and then plug the computer into the HC's USB (or serial) port. There is no easy option otherwise these days. In the past, you could use Celestron's NexRemote software, and the PC port provided by their port expander module, but that has been out of production for years. 3. Yes. As above, it requires ASCOM and works fine. Fantastic response Mark, very detailed and clear response explaining what and where I need to go. I need to make a couple decisions as to which way to go, but because, I'll probably try to simplify things until I can get both feet back on the ground!! Thank you for taking the time to explain and I hope you don't mind a newbie asking dumb questions!! Thank you for the feedback Tom K., and coincidentally, I am working on the lead issue (I HATE A TANGLED MESS) and in the process of collecting similar length leads and assembling them together with labeling to ensure ease in set-up, but now I'll ensure labeling for the same connection points each time I set up! Thank you for sharing your experiences and I am guessing that I will leave the Hand Controller connected and feed through it's bottom mini-USB port. Thank you for taking the time to answer and explain!! Do I understand you correctly, "You need to first align with the HC and then plug the computer into the HC's USB (or serial) port." Do you mean that I should (or have to) first align or use the Hand Controller, then I can connect the PC to the bottom HC Mini-USB port; i.e., the computer must not be connected during HC operation?? Thank you for you feedback and all the responses above go a long way in helping me get things set up before the weather gets a bit more comfortable! Thank you for the time and sharing your experience!! Yes, unless someone has another way to do this (other than wireless) you have to go through the handpaddle. If you have it permanently mounted you can hibernate the scope from inside and it will remember its alignment so the next day you can just wake it up and get going without doing an alignment. I moved on to plate solving so I didn't use the GOTO functions anymore. If you image at lower focal lengths, balance correctly, and don't overload the mount you can do some good work with the AVX for sure. Not sure this was covered but Backyard EOS is awesome but only controls your camera. It is mount independent. So somewhere there has to be the capabilities of the hand controller. It can be the physical one or it can be software based and built into a scope control app. As I mentioned above there are only 4 apps with this capability - the old obsolete NexRemote, Celestron's CPWI or SkyPortal, or SkySafari. These days SkySafari seems to be the most popular app for scope control that has the wireless connectivity to go directly to the mount without using the physical hand controller. This hand controller functionality allows an initial alignment to be done. This alignment builds a model of the sky and it loads the motor controllers in the mount with the correct info to do gotos. It's also not a surprise that there is only one non Celestron app with this capability - Celestron specifically licensed only Simulation Curriculum to have it. Most folks who are using something other than SkySafari will simply keep the physical hand controller in place and perform the initial alignment at the beginning of the session as normal, and then connect to a PC and let a mount control app generate the goto requests. This is where all this scope plugin/ASCOM/INDI stuff comes in. You can often leave the PC physically connected to the hand controller while doing the initial alignment but it's a good idea not to try and do anything software wise until the initial alignment is done. Once the initial alignment has been done and the PC app has connected to the hand controller it's best to completely ignore the hand controller. You don't want to do anything with the hand controller that generates another goto. You can however use the direction buttons to move the mount a small amount without messing things up. Generally though, in this situation you just really want to leave the physical hand controller alone after the initial alignment has been done. Edited by mclewis1, 15 February 2019 - 03:56 PM. I had also sent Celestron Support a question regarding the Hand Controller and they told me to try Celestron NexRemote and I downloaded and installed it (Running Windows 10). It appears to be working as advertised (In the living room); I hope to check it out sometime in the next week or so. They also say to NOT use the HC when using NexRemote due to errors with both connected. Here is what it looks like on my desktop. Am following the discussion closely here. About to order an AVX to use with my Micro Four Thirds camera gear here. No scope for now, may be add a refractor later. Also hoping to control it with either mobile device- phone or tablet- or laptop later. Will send you a note and add you as a friend, if I may Koja, to compare notes. I don't want to hijack your thread by any means, will post in this forum separately what I am contemplating which includes adding the StarSense alignment camera and the GPS. Probably even colder in MN than it is here in the Green Mountains of Vermont. Good luck! Yep - that's the one. I would use that virtual handpaddle to get connected and then hand off to APT or SGP. I used SGP mostly and let it handle slewing and platesolving. The image of Rosette was made over three nights using SGP platesolving and it put the camera on pretty much the exact same spot each night. NexRemote is a nice app, and it's very useful for those of us who want to run the scope totally remotely (even doing initial alignments remotely). But, if you are also going to be using SGP or some other mount control program you will probably find that after an initial period of time that you won't find much use for NexRemote ... although they do work well together. The virtual serial port feature allows a mount control app to work through NexRemote and the serial/usb connection to the physical hand controller. First remember that it's development stopped almost 10 years ago. It's a ver 4 hand controller so there are functions in the physical NexStar+ hand controller when used with the AVX mount that are not available in NexRemote, such as the Meridian function. There are functions in the hand controllers that allow you to fine tune the alignment and improve pointing accuracy (Alignment star replacement, Sync, and Precise Goto functions). Most external mount control apps offer some capabilities to improve pointing accuracy without those hand controller functions, and in some cases (such as using plate solving) can actually improve on what is available via the hand controller. If you don't want or need to do initial alignments remotely (most folks even if they operate the mount remotely don't want the bother of doing remote alignments) then you'll probably find that after a while you'll end up using SGP or similar app for all the pointing/mount control functions needed. Edited by mclewis1, 16 February 2019 - 03:07 PM. I appreciate your advice and I'm listening to the experience here very closely; I know I am probably going overboard. I am still learning and hopefully I keep learning. Having separate software for Alignment; Aiming & Tracking; and Guiding are understandable with all the different makes and models of equipment, As long as they are compatible when running together, I will be happy. I am glad a friend directed me to this blog as you and others have already driven the bumpy road I'm on and willing to tell me where the bumps are!! Thank you all for the help!! Sounds good and I'll watch for your thread. All I'm using at the moment is a DSLR and a few lenses. I am not familiar with a Micro Four Thirds Camera and hope to see some pics. John, That's a good attitude. A little bit overboard isn't such a bad thing. You'll find that your own experience will end up being your most valuable commodity. Thank you Mark and thank you for sharing such great info!! I don't really know what results I can get of some of the deep sky pics with my equipment, and am really just trying to take better and cleaner pics of the images I can reach. My strongest lens has a focal length of 600mm X the cropped sensor size of 1.6 giving me more like a 960mm equivalent. Noise is probably my biggest problem and maybe for many of us; if I can reduce it with longer exposures at lower ISO, tracking stacking, etc., I'll be a happy camper! !